To what extent do you agree or disagree with the following statement: "The economic crisis has damaged my confidence in business as a whole"? 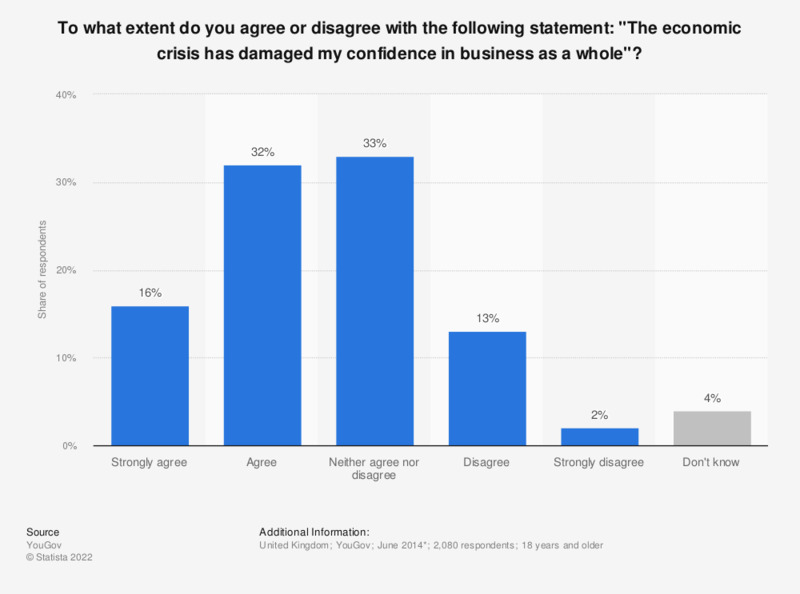 This statistic shows the responses that adults from the United Kingdom (UK) gave when asked "To what extent do you agree or disagree with the following statement: 'The economic crisis has damaged my confidence in business as a whole'" as of June 2014. A large share of respondents (48 percent) felt that the economic crisis had damaged their confidence in business as a whole, and a third of respondents felt neutral to the question. To what extent do you agree or disagree with the following statement: "Businesses do not take effective action to regain trust after it has been damaged"? To what extent do you agree or disagree with the following statement: "Business should be more transparent about what it does"? In the last year the international financial crisis has been often topic of discussion. What do you think about this financial crisis? In the last year the international financial crisis has been often topic of discussion. When do you think that this financial crisis will be solved?